Posted February 19, 2018 by Diane & filed under My Books. I’m rather chuffed at how well this came out. See what you think! Thanks so much again to Antonio Javier Caparo for the art that is making these first glimpses of my book sing! Posted February 12, 2018 by Diane & filed under My Books, On Scotland. 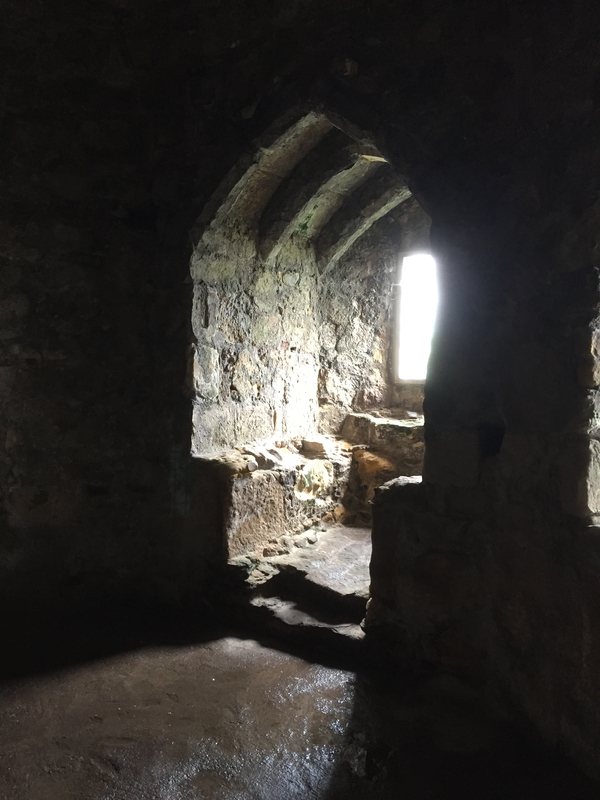 This is Part 3 and final installment of a series of posts about how I’ve been inspired by Scottish castles to create scenes in my novels. I’ve taken considerable fiction license here. This is actually Dirleton’s expansive Lord’s Hall, a room meant to impress guests and visitors. But that’s what I wanted for this chamber: a dramatic, vaulted-ceilinged space much larger than most lords would need for their bedroom. I did this for a reason: The Lord Faintree who had this castle built saw his solar as yet another way to exert his power. He’d hold private meetings and his own lessons for his son here and use this room to enforce his authority. That Lord Faintree knew how to use space to intimidate. When you read the solar scene, go ahead and think of that. I hope you’ve enjoyed these examples of castle-to-fiction scenes in the first book of Drest’s adventures. Thanks once more to Historic Scotland Environment for its masterful stewardship of Dirleton and all its other incredible heritage sites. Posted February 10, 2018 by Diane & filed under My Books. If you’ve met me in person, you’ve probably heard me go on a bit about Scotland. (And if you know me on social media, you’ve seen that too.) 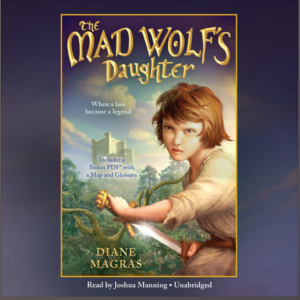 So, with my book placed in 1210 on the Scottish lowlands (most the Borders and the coast), it should come as no surprise that I was hoping that the audiobook of The Mad Wolf’s Daughter would feature a reader who could speak with a Scottish accent. Now, of course, that wasn’t the only item on my wish-list. I also wanted someone who could tell the story well, who would delve into the adventure element the way a master storyteller would, who’d be able to convey its legend and mystery, the excitement of the historical aspects, have a rich voice for the narration, and be able to capture all the characters’ voices convincingly (that would be Drest, Emerick, her father and her brothers, Tig, the villagers, the knights)…it’s a bit of a wish-list. Imagine my excitement when I heard an audition for this narration that captured all of this very nicely…and then notch that up a few levels when I heard the final recording of the first chapter. Which captured all of it perfectly. Here’s Joshua Manning reading Chapter 1 of The Mad Wolf’s Daughter. Here’s yet another moment in this writing journey where I can honestly say I could not be more thrilled. Posted February 1, 2018 by Diane & filed under Story Bites Writing Prompts. As explored in a past story bite, setting is a crucial part of any story. It’s the world in which your characters live, and can be a character itself. Any world is made of a variety of features, from landscape and weather to buildings and roads. For this story bite, I want to look closely at ways that you can build a setting through details. This is Abbotsford in Melrose, Scotland, the home of the great 19th century author Sir Walter Scott. Largely responsible for the creation of the historical novel, Sir Walter Scott built this home to be his own personal castle. 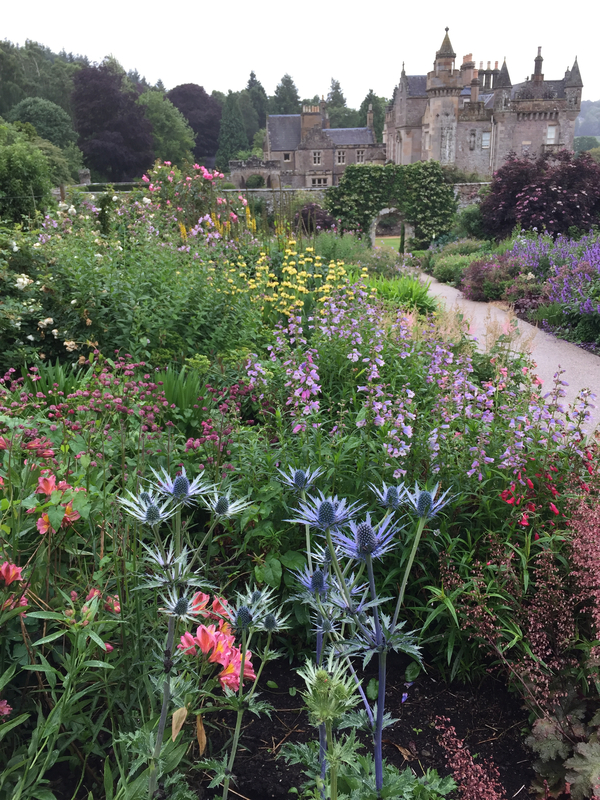 A setting like Abbotsford offers many fascinating details, but let’s have your story begin in this picture, at the top of the garden looking down at the house. And for this story bite, let’s focus on exactly what you see. We’re working on setting description and, specifically, details. When you look at this picture, what’s the first thing you notice? What can you say about that thing? What other things do you see, and what colors, shapes, and textures can you describe? What’s the overall feel you get from this picture? Does it make you comfortable? Happy? Sad? How do those colors, textures, and objects lead you to feel that way? When you’re writing a setting, details like this help the writer evoke emotions in the reader, which is a great way to prepare a scene for action. Details can have special meanings too: repeating throughout a work, or as something a character remembers later on. Give this description a try. Your story bite assignment is to write what you see in that picture, sharing as many details as you can imagine. Paint the scene with words. Make this a paragraph—or write more, if you feel inspired to. If you’d like to share your story bite with me, please submit it through your teacher or with your school email address or home email address and include: your first name, grade, school’s name (or “homeschooled”), town, and state. Teachers: if your make story bites part of a lesson, please let me know how it went. And share them! I’d love to see your students’ work. Posted January 21, 2018 by Diane & filed under My Books. 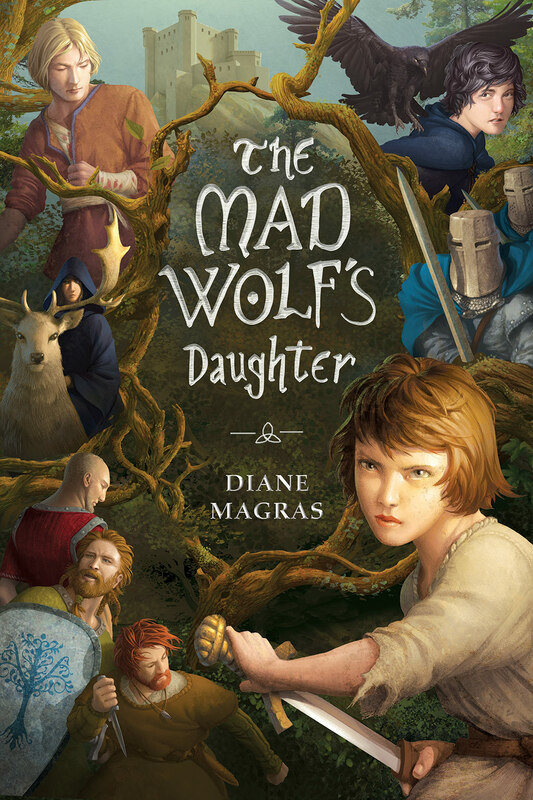 Thank you to everyone who has shown interest and enthusiasm for The Mad Wolf’s Daughter. It’s so exciting (and a bit unbelievable) that my wee lass’s tale is so close to being in print. Its publication date, March 6, 2018, is coming right up! 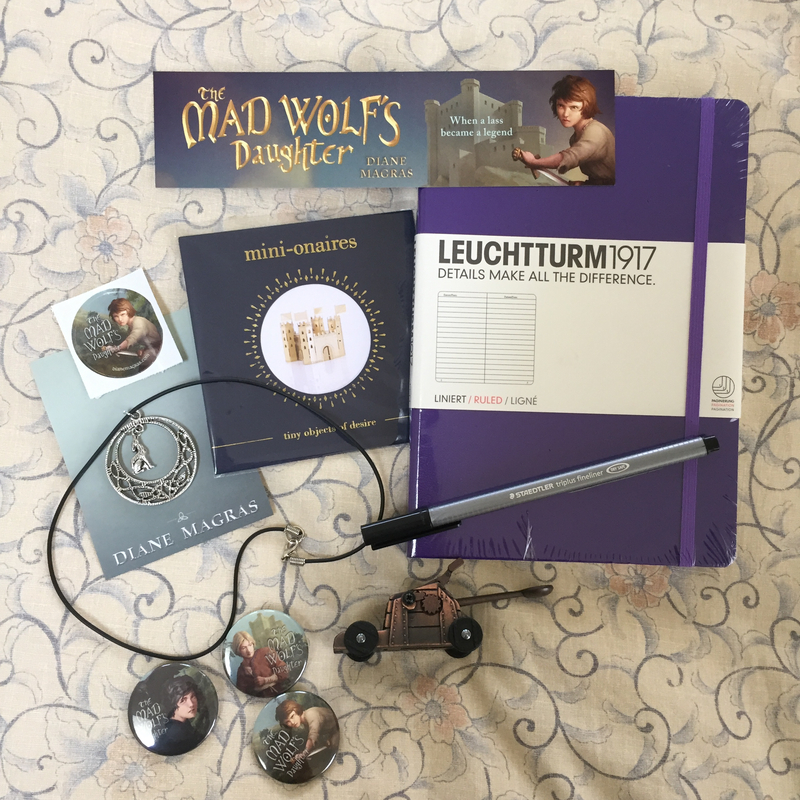 Everyone who sends me a receipt will receive this wee package (as long as supplies last!). One person will win each of the First and Grand Prizes. 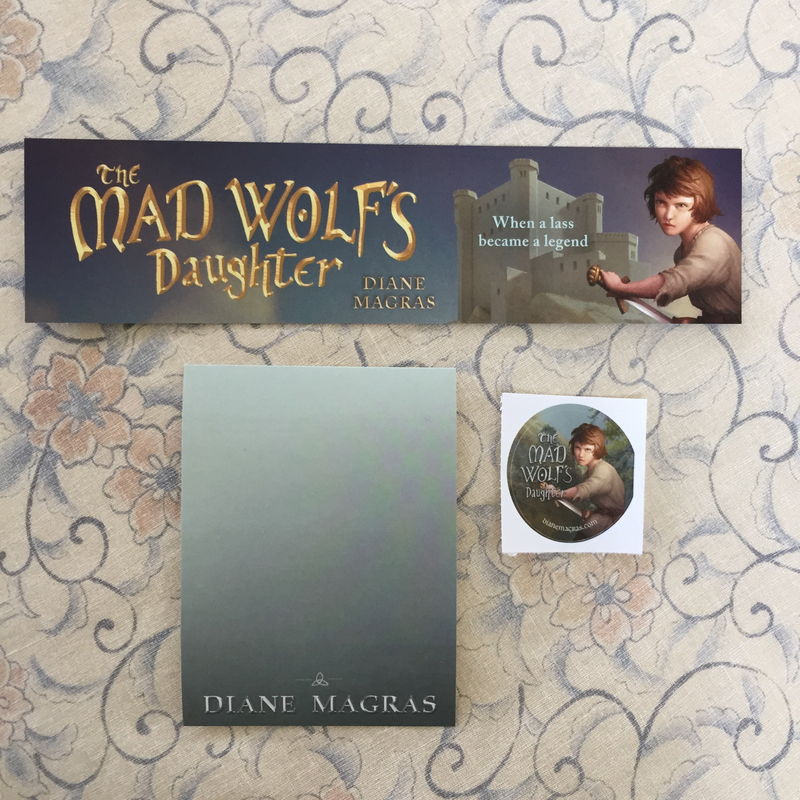 Again, to enter, send a picture or scan of a preorder receipt for The Mad Wolf’s Daughter before or by March 5, 2018 (email it to me, along with your mailing address). I’ll do the drawing shortly thereafter. Posted January 14, 2018 by Diane & filed under My Books, On Scotland. 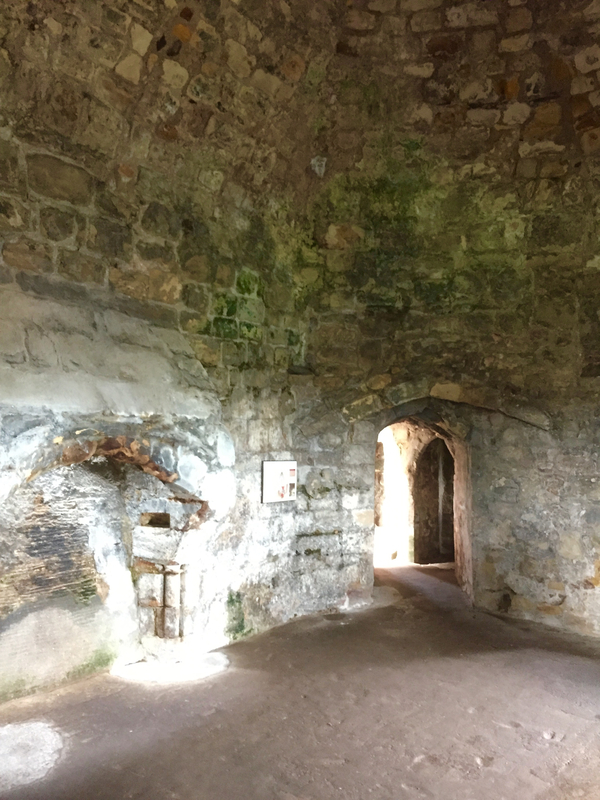 This is the second post in a series of how I’ve discovered crucial details within the castles of Scotland to inspire a scene in my fiction. Today’s post is about doors. 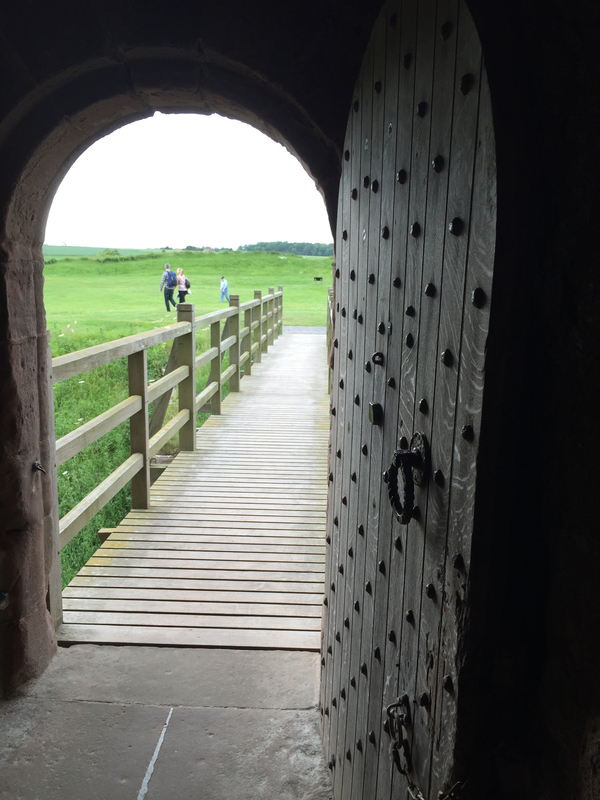 This door is from Tantallon Castle near North Berwick. I like the solid wood of it (oak, I assume, as my castle’s door is), and the fact that it’s pitted with iron nails. This is something easy to find in research books, but it’s quite the feeling to run your hand over a slabs of wood smoothed by the years and finger those cold iron lumps—and think about all the weapons they must have dulled! 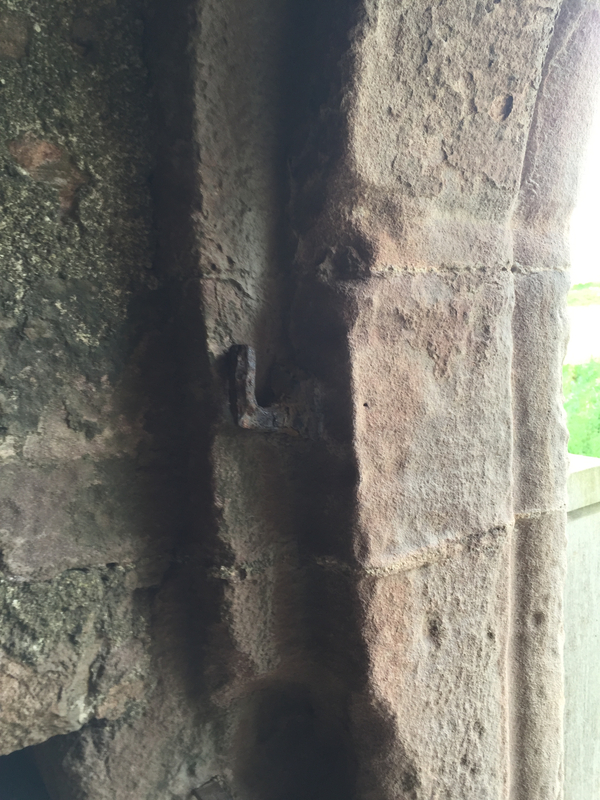 And here is a finger of metal to create a hook, built into the castle where a bar might have held the door shut. Note the grooves carved into the stone: That shows where the original door lay. The scene with the castle door occurred near the end of The Mad Wolf’s Daughter. My protagonist was helping to block the door and slip a piece of wood into a slot. If someone was trying to enter, you’d need to hold the door shut with your weight as you put it in the bar, which would be difficult if the people trying to enter were pushing with their weight. In my scene, a heavier person was helping my protagonist keep the door shut. That may sound exciting—and I certainly meant it to be—but you won’t find that scene in my book now; I ended up rewriting that chapter several times to create earlier dramatic moments, so the battle-to-keep-the-door-shut scene no longer was relevant. In fact, I don’t even mention the door in the final draft! But there really is a nail-studded door like this one—I promise. You’ll just have to imagine it yourself in the current scene. Much novel research is like this: Learning details, having a clear image of a setting in your mind, and sharing only a little bit of it with the reader (or sharing a lot and then deleting it all when you revise). I like to get my details just right, even if I do cut their actual mention in a novel itself for the sake of tight prose. Many thanks, as always, to Historic Scotland Environment for all its work to keep heritage properties like Tantallon Castle in great historic shape, as well as public for all of us to enjoy. Posted January 8, 2018 by Diane & filed under My Books. Now, book review stars, as my book critic husband always tells me, are not a science. Critics assign them just when they really love the book at hand. 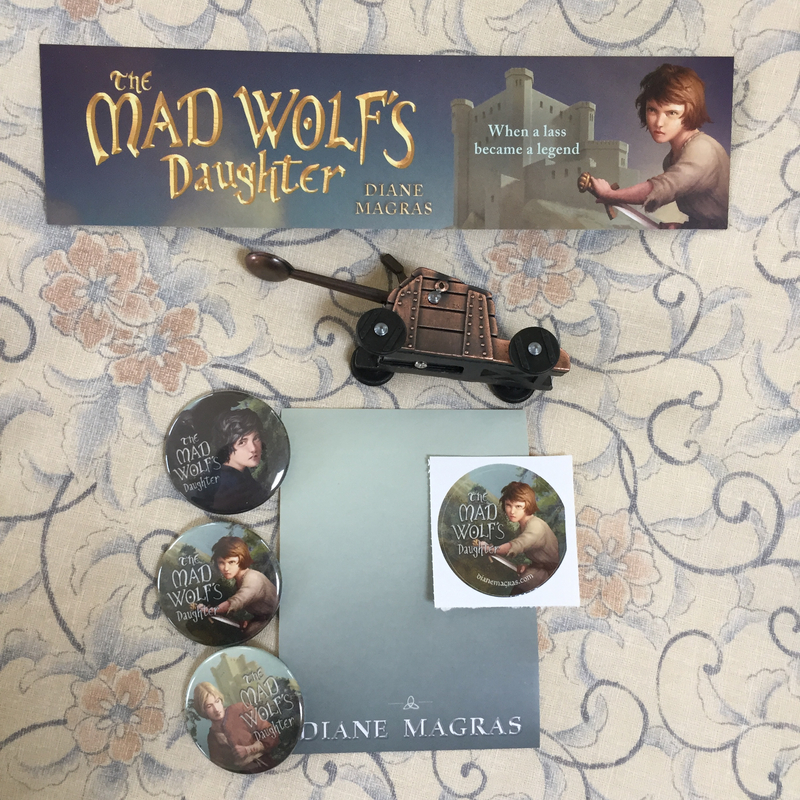 So I feel especially chuffed to have someone at this well-known publication feel so enthusiastic about The Mad Wolf’s Daughter. Here’s my beautiful old cover, which was updated to the beautiful new one on the website. I post it just to share what’s on the review, as this is the cover for the ARC. The incredible art for both is by Antonio Javier Caparo. Posted January 8, 2018 by Diane & filed under Story Bites Writing Prompts. Conflict is an essential part of any good story. It’s what you throw at your characters to make their lives difficult. Conflict can be as universal as someone/something threatening destruction of the world, or as personal as trying to avoid hurt feelings. Conflict is what stands in the way of your character’s attempts to achieve a goal, or what makes the goal necessary, or what just makes your character miserable. 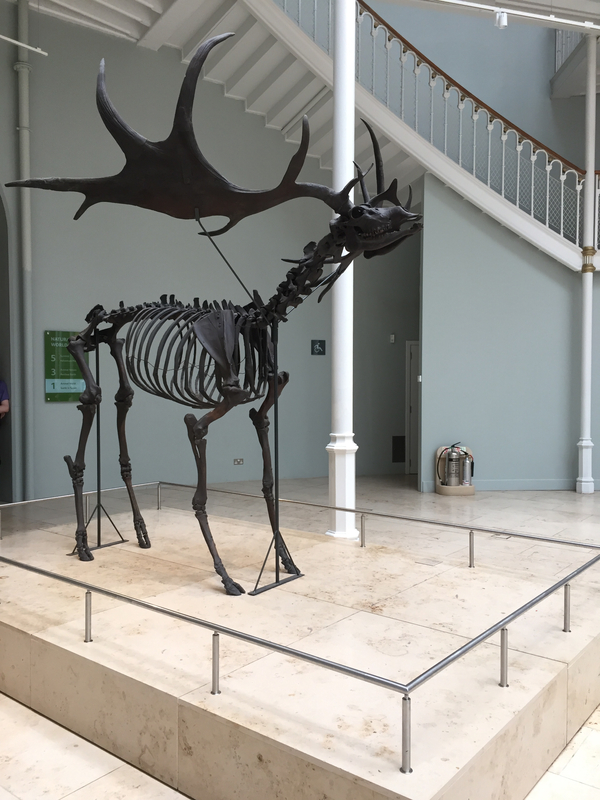 For this writing prompt, please take a look at one of my best friends at the National Museum of Scotland: the Megaloceros giganteus (or giant deer). Impressive, is it not? This 12,300-year-old skeleton from the Isle of Man dominates the end of a long, bright, airy space. I’ve always seen it surrounded by light. But let’s imagine Giant Deer in the museum in the dark, at midnight, with only tiny security lights blinking about the room. And let’s imagine that it’s alive. What does Giant Deer want? To go to sleep forever? To see/chat with/destroy (gasp!) the other exhibits? 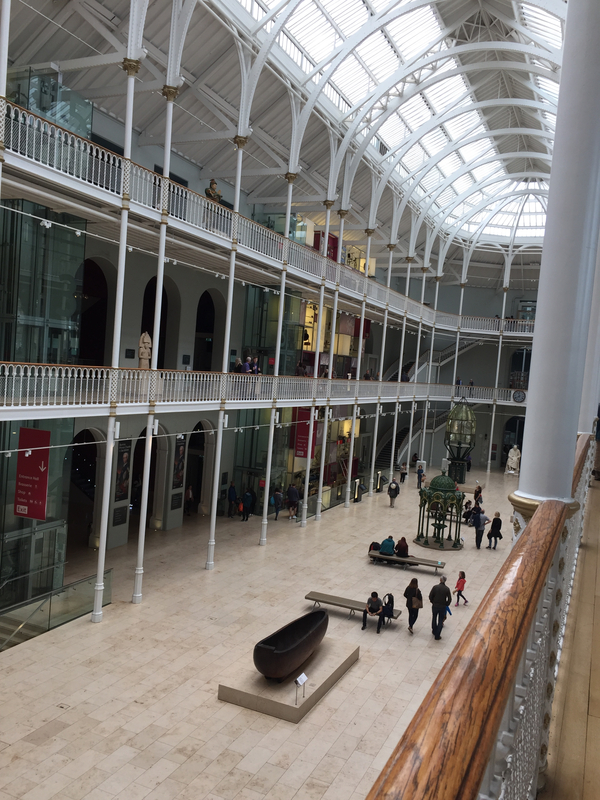 Merely to talk a walk around the museum? Pick a goal from this list or create your own goal for Giant Deer, ask yourself why it wants that, and then answer this: What is preventing it from doing what it wants? Conflict is especially powerful when it pits two people (or creatures, or a person and a creature) against one another. So you may want to create a second character to make Giant Deer’s conflict especially tense. How about a kid who’s there as well, having sneaked into the museum after hours? To escape a monster (human or supernatural)? To run away from a dangerous situation at home? Once you know why the kid is in the museum at night, start creating your story bite. Good luck with this one! And I hope you have fun! Posted December 31, 2017 by Diane & filed under Miscellaneous. Sometimes the world can feel overwhelming. Illness (our own or that of loved ones), alarming happenings around us, or disappointments of professional or personal kinds can each drag us under the border of happiness like an undertow in the sea, and keep us down. This year has been a challenging one for many people for many reasons. 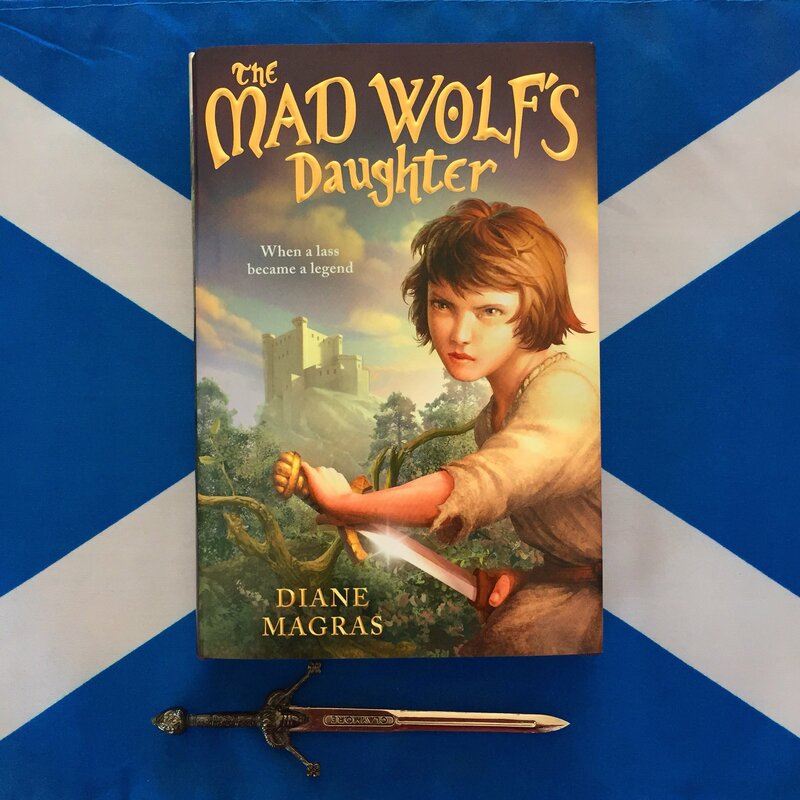 For me, it’s been a powerful mix of excitement (seeing the final cover, blurbs, and first review of The Mad Wolf’s Daughter; and visiting Scotland with my husband and son) and frustration (U.S. and U.K. politics). Every day, as a means to ground myself, I’ve made sure that I find something small to notice and appreciate. It has been a pattern in the early autumn ice, the changes I’ve detected in my son’s laugh as he nears age 11, a crow’s antics with a crust of bread outside my writing nook window, the pungent taste of the bittersweet chocolate I received as a gift. Finding ways to appreciate the little things of life can help us all feel comforted, and sometimes even strengthened. 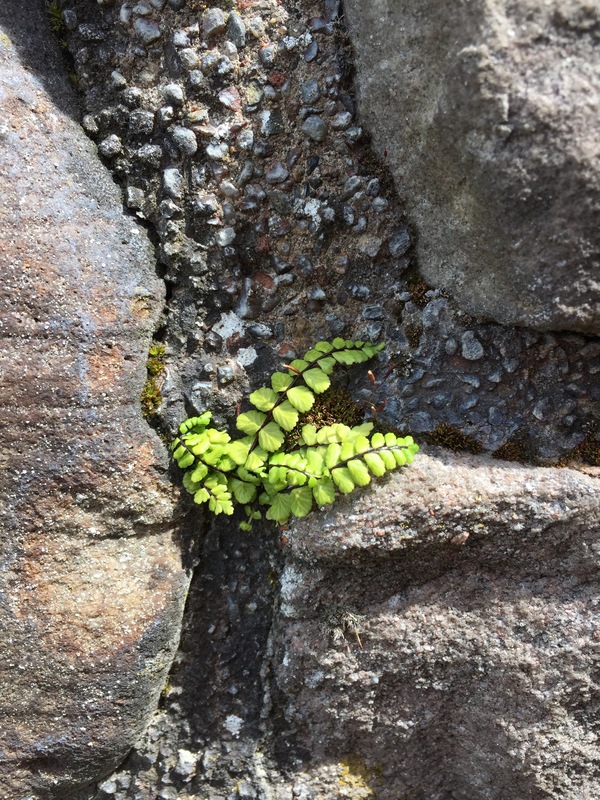 Intentionally finding those small glimpses of beauty in everyday life is something my mother taught me by her example in 2015 as she found ways to enjoy the life that ALS was taking from her. Here’s my hope to all of you for a good year ahead, filled with many beautiful things large and small.